Having skunk smell in your house can be a bothersome situation for everyone involved. Even if you get somewhat used to it, the same just cannot be said for other people that might step into your home. And having a smelly house is definitely not a good impression to leave. Worse yet, the smell can quickly spread across the house, causing distress. 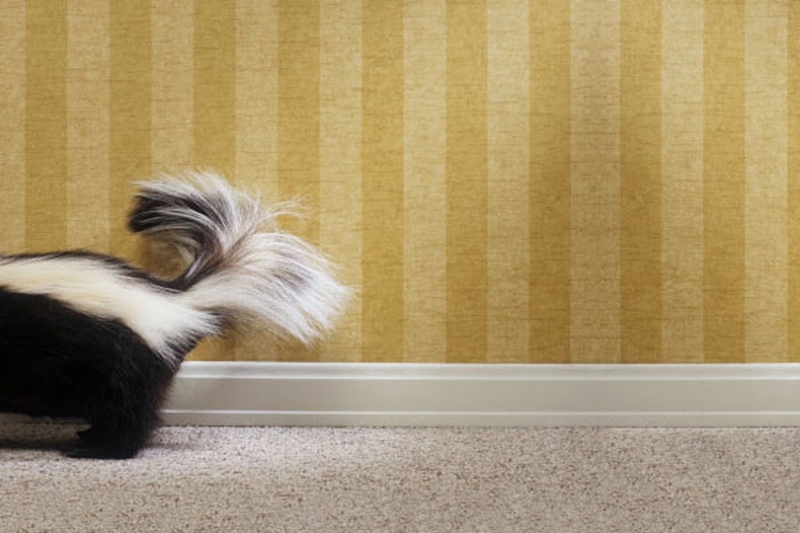 Here are some tips on how to get rid of skunk smell in the house fast. First of all, make sure you're not mistaking skunk smell with the smell of something burning! These two smells are very similar in nature, but confusing them is very dangerous. Once you've determined the source of the smell and excluded the possibility of something burning, it's time to check whether the skunk is still in the area. Step outside your home and take a deep breath. If the smell outside is better than the one inside your house, proceed to open the doors and windows, so the air can start circling around. If that doesn't solve the problem, it's time to get active. So this is how you get rid of skunk smell in the house. Gather some household cleaning agents like vinegar and put them in a bottle, then just spray them around the house. This will help neutralize some of the smell. Truth be told, vinegar doesn't smell too pleasant either, so make sure you've got some air fresheners at hand. Anything that has a citrus-like smell will do. There's a neat trick that you can try. Mix some citrus or mint air fresheners with water and boil it so the scent gets to spread across the room. That way the refreshing scent will get mixed with the old skunk smell, making it less intensive, and therefore more pleasant to cope with. This is one way of getting rid of skunk smell in your house. Sometimes if you can't determine the real source of the smell, check your pet. You might be surprised, but sometimes the pet might be carrying it around on its fur. If this is the case, make sure to give your pet a bath. Chances are, a single bath is not going to cut it, so be prepared to bathe it multiple times. And take your time while doing so. Set your expectations low. Most of the time it takes a couple of days to get rid of skunk smell until it gets neutralized. It can be very persistent, so make sure to expect it. Do you have some fans in your home? Turn them on! You should do this as soon as possible, because otherwise you're risking the smell getting ingrained further into your furniture and fabrics. It's best to do this when you have some windows open for maximum effect. And don't forget to change those air filters! Failure to do so will result in you smelling skunk air coming out of your vents. After you've done so, it's time to thoroughly clean your carpets if you have any. This is how you can remove skunk smell in your house, that's on the best ways to get rid of it. The same goes for other fabrics - clothes, blankets and such. If you wait around for too long, the smell can become stale, and it's going to be even harder to get rid of. Last but no least, try using tomato juice to cope with the smell. Sadly, it won't remove the source of the odor, but it will trick your nose into thinking that the smell is gone, because the skunk smell gets overridden with something stronger. If you follow these steps and stay patient, your house will be skunk smell free within a couple of days. If you got sprayed by a skunk and the oily residue can be found on your skin and want to get rid of that nasty skunk smell fast, don't think that taking a shower is going to solve it by itself. As a matter of fact, it can only make things worse. Getting the oily residue out of your skin is very hard, because water does not remove it just like that. Worse yet, it can help spread the smell across the clean areas of your skin and the bathroom, making it seem like you have a thousand skunks in there. Server responsed at: 04/18/2019 12:54 p.m.